For the Spanish golfer (born 1986), see Jorge Campillo (golfer). Jorge "Popeye" Campillo Hidalgo (born August 10, 1978) is a former right-handed pitcher. Campillo was signed as an undrafted free agent by the Atlanta Braves on February 14, 1996. 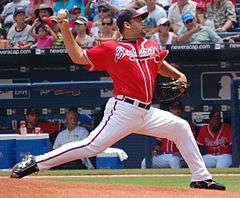 Campillo was released by the Braves after the 1996 season and signed with a team in the Mexican Pacific League. The Mariners acquired his rights and signed him on March 26, 2005. He made his major league debut in 2005 with the Seattle Mariners, playing in two games during the season. After leaving a game in 2005 with an injury, Campillo required Tommy John surgery and subsequently missed most of the 2006 season. After rehabbing, Campillo made a rocky first post-surgery appearance with the Mariners in late 2006, after the team purchased his contract from Triple-A Tacoma. He became a free agent after the 2006 season, but was re-signed to a minor league contract by the Mariners. Campillo played Winter Ball prior to the 2007 season, when he very successfully headlined the Triple-A Tacoma Rainiers' starting rotation. His recovery complete, Campillo led the Pacific Coast League in ERA. After the end of the minor league season, he was recalled to Seattle, where Campillo made several successful appearances out of the Mariner bullpen. Campillo became a free agent after the season. On December 17, 2007, Campillo signed with the Atlanta Braves to a minor league contract with an invitation to spring training. Campillo did not make the 2008 opening day roster but soon received a callup on April 10. He made his Braves debut on April 13 in a relief appearance against the Washington Nationals. Campillo made his first start as an Atlanta Brave on May 20, 2008. He pitched 6 innings and was credited with a win. On October 12, 2009 the Atlanta Braves outrighted him to the Gwinnett Braves and he elected free agency. On November 20, 2009, Campillo signed a minor-league contract with the Kansas City Royals. Since earlier 2011 he became Tigre de Quintana Roo, a Triple A team in the Mexican League. And they won the championship. ↑ "M's acquire rights to right-hander Campillo". The Seattle Times. Associated Press. 2005-02-17. Retrieved 2011-07-26. ↑ "Jorge Campillo". Major League Baseball. Retrieved 2011-07-26. ↑ Odum, Charles (2008-05-20). "Between the Seams – Ex-Mariner Jorge Campillo gets starting chance with Braves". The Seattle Times. Associated Press. Retrieved 2011-07-26. ↑ Stone, Larry (2006-09-26). "M's Notebook – Campillo back to help bullpen". The Seattle Times. Retrieved 2011-07-26. ↑ "Braves agree to terms with catcher Javy Lopez on Minor League contract" (Press release). Atlanta Braves. 2007-12-17. Retrieved 2011-07-26. ↑ "Gems from Glavine, Campillo help Braves sweep DH from Mets; Church hurt". ESPN. 2008-05-20. Retrieved 2011-07-26.